Does your dog deserve a Good Fur Day? 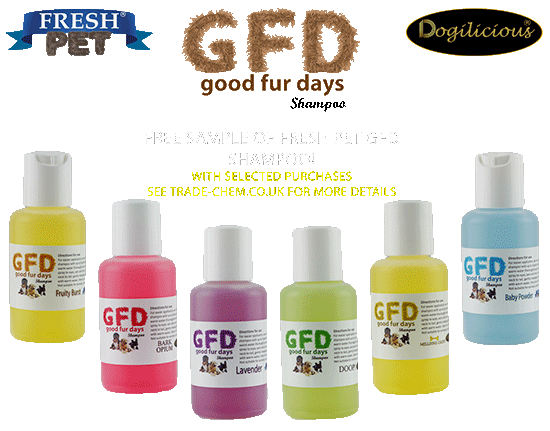 GFD, featuring the best of Fresh Pet and Dogilicious, OUT NOW! A powerful cleaning, disinfecting and deodorising range. Cleaning products that care for your vehicle. Our XR Pro is top grade, heavy duty reliability. An outstanding range of indoor and outdoor cleaning. Speciality ranges available. All points redeemable at any time. Bonus points available with custom deals via the chat box at the bottom of the site. Chemicals, cleaning and pet friendly hygiene! We manufacture and offer professional products available to order immediately either by phone or online with next day nationwide deliveries. Our wide range of pet friendly products is one of our biggest hits with very good reason. From doggy deodorant to kennel cleaning disinfectants we have a fantastic range of original products! PSSST : WE ALSO GIVE OUR CUSTOMERS PETS THE OPPORTUNITY TO BE ON OUR PRODUCT PACKAGING. JUST CHECK OUT OUR BUSTLING FACEBOOK PAGE TO GET INVOLVED! Covering industries such as cleaning, housekeeping, heating, and renewable systems, farming, fragrances, specialty, vehicle care, and animal hygiene. We have everything from our very own specialist ranges such as Fresh-Pet to well-known generic products with many uses such as borax and rubbing alcohol.